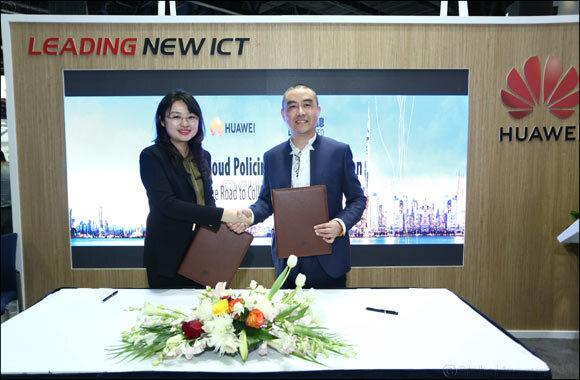 Dubai, 21 Oct 2018: Huawei, a leading global provider of information and communications technology (ICT) infrastructure and smart devices, signed a memorandum of understanding (MoU) with Dragon INFO to develop a Video Cloud Policing Big Data Solution. The two companies signed the MoU at the region's largest technology exhibition, GITEX, in Dubai. Huawei's AI portfolio includes its new Ascend series of AI chips – the world's first AI IP and chip series designed for a full range of scenarios. The portfolio also includes new products and cloud services that are built on Ascend chip capabilities. The Huawei-Dragon INFO collaboration will be enabled by the emerging 5G broadband digital ecosystem. Globally, Huawei was first to unveil a full range of end-to-end 3GPP-compliant 5G product solutions, covering the core network, bearer network, base station and terminals, and the world's first 5G chipset. Huawei is a pioneer in the emerging 5G technology which will provide users with multiple gigabit speeds within homes, offices and public spaces.